Découvrez la véritable authenticité et l'hospitalité du Costa Rica. Entouré d'un décor naturel majestueux et montagneux avec le soleil à l'horizon. Vous pourrez admirer la vue depuis le patio. Nous pensons que c’est le meilleur endroit pour se détendre. Loin de tout bruit de la ville, mais suffisamment proche de certaines attractions touristiques. Dans l'ensemble, plaisir et détente garantis. Toute la journée. We stayed for three weeks and used Skeeter and Alan's place as a home base from which to explore CR. We stayed at many very nice places but this was definitely the best. We always felt that we were returning home after being away for a few days. It was a clean, quiet, attractive refuge with some amazing sunsets. Skeeter was a good host always ready with travel tips and helpful advice. We drove to most of the places we visited except San Jose as the buses to the city were frequent and convenient. There are a few good restaurants and several excellent sodas for breakfast and lunch, all between Puriscal and Grifo Alto. We especially enjoyed shopping at the local farmer's market on Fridays as we generally prepared our own meals in the well-stocked kitchen. All in all, we happily recommend Skeeter, Allan, Ganesha, and El Rancho. What a beautiful, serene place to stay. We loved our 2 night stay, the views are magnificent. Alan was very helpful and a great host. We also fell in love with the dog. We made a mistake to let our GPS to take us from San Jose via 136 - don’t do it. It shouldn’t be even on the map except for 4x4 vehicles. Mountain, washed out rocks and boulders steep and narrow road. There is a much better way to get there. My husband and I recently stayed at this gorgeous property in December of 2018 and we were so sad when we had to leave it. Prior to arrival we were given the exact coordinates to the driveway of this gorgeous thirty acre piece of tranquility (it’s not in Santiago De Puriscal as Homeaway claims, it’s closer to Grifo Alto) Be advised that the road leading to the gate should really only be attempted in a four wheel drive with high clearance. You should have one anyway if you want to get off the main roads and see the real Costa Rica! We rented a Toyota Prado Land Cruiser and LOVED it. I regress... upon approaching the gate which skeeter left unlocked for us, we entered the prettiest gardens we have ever seen! There was so much attention to detail in these gardens and everything was so perfectly manicured! We were in awe! We drove up the 100 meter driveway to our rental. Skeeter met us in the driveway (he lives on site but give you all the privacy you want). We were pleased to meet Skeeter. He’s an American who understandably wanted to retire in this gorgeous country. Of course he knew perfect English and was a wealth of knowledge when he recommended many attractions in the area. We didn’t have the pleasure of meeting his son Alan (we hope to next time). Our stay within the home was amazing. The rental was well stocked allowing us to do all our own cooking, and the views were incredible. It was so quiet at night but in the morning you got to experience the sounds of a jungle with all sorts of birds singing (including toucans and motmots!) There are plenty of things to do in the area if you like to hike and I hear San Jose has a lot of interesting attractions. We stayed away though as the driving there was hazardous! Thank you Alan and Skeeter for this fantastic stay! We hope to see you again very soon! If ever you thought the traveling to a foreign country would make you feel like you are out of place, This house makes you feel right at home. Everything you could possibly need was at your fingertips and the homeowners made a point to make you feel at ease. Skeeter and Alan greeted us, got us settled in and made us feel like old friends from the moment we arrived. They offered suggestions, directions and great insight. We couldn't have asked for better. “the happiest place in the world”, Costa Rica. . You got to meet many locals and expats alike coupled with your own personal adventures throughout this small piece of global paradise known as Costa Rica. So many of our guests are repeat visitors and we trust you won’t be the exception. Awesome mountain and ocean sunset views! If you're looking for a beautiful place in the mountains look no further. The treetop apartment is very well equipped with everything you need for your stay. The views from the inside and outside are amazing. Skeeter and Alan are great hosts and willing to help guests with whatever you require. Skeeter even took the time to take us to a local Tico restaurant where you catch your own fish dinner and they cook it up especially for you. Don't hesitate to stay at either of their rentals. 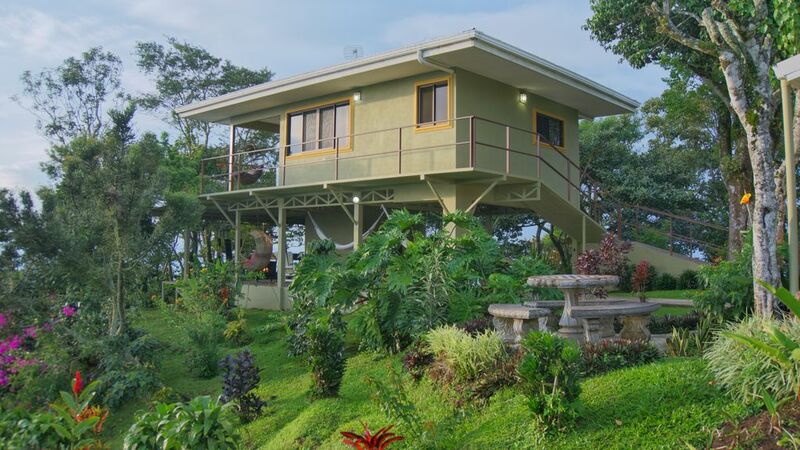 The upper rental has even more amazing views of the mountains and Pacific ocean. Great people, great value! Thank you again Skeeter and Alan!! We had a very enjoyable stay at Alan's villa. The views are spectacular from sunrise to sunset. The grounds are expertly maintained featuring beautiful landscaping with a wide variety of plants, flowers and trees. The villa is well equipped with all the essentials and the wifi reception was very good. Overall, a great place to relax and rewind. Your compliments are greatly appreciated and make all the effort we put into providing our guests a positive and pleasant experience - worthwhile. We’re always pleased to share the Pura Vida lifestyle with good people like yourselves.